Viet Duc Hospital (BV) is the first unit in Southeast Asia and second in Asia to perform spinal surgery with precision positioning robot Renaissance. After 5 years of implementation, nearly 1,000 patients were successful surgery, the most in the area. This is a miracle of Viet Duc Hospital, because spinal surgery is extremely complex and difficult. At the workshop to update the latest advances in robotic spine surgery held on April 26 in Hanoi, Prof.Dr. 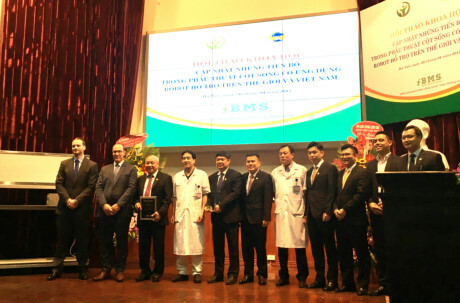 Trinh Hong Son, deputy director of Viet Duc Hospital, said: With the boldness of leading the operation of Renaissance robotic surgery, Viet Duc Hospital’s spine surgery has contributed to improving the quality of treatment for patients, Especially not to happen any complication whether new technology. BV has been recognized by patients as well as world experts as spinal surgery centers for positioning applications that accurately support Renaissance robots for the first and most Southeast Asian patients. Amir Kimel, Director of Mazor Robotic, highly appreciated BVG Germany’s leading position in the application of robots to spine surgery, reflecting the vision of BV leaders in pioneering the challenges to bring Scientific advances into the treatment of spine-new field in Vietnam. At the workshop, Assoc.Prof.Dr. 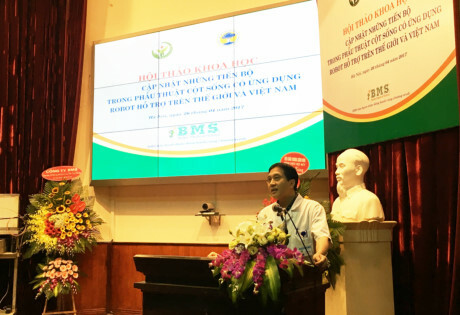 Nguyen Van Thach – President of Vietnam Orthopedics Association, Vice President of Asian Orthopedic Trauma Association – who introduced the technique of spinal surgery with robot to Vietnam, reported the results of performing robotic surgery by robots. Renaissance for patients from 2012 to present: Robotic surgery brings many benefits for patients because of advantages such as less invasive, minimal intervention, small incision, less bleeding, limited infection, time lying Short hospital, fast recovery and special robotic surgery with very high precision. In the spine field, robots are used in lateral interventions, particularly in less invasive surgery. Application of surgical-assisted robes such as screwing of the thoracic-lumbar spine in the pedicle for cervical distortion surgery, spinal injury surgery, spinal disc herniation or spinal stenosis, cement injection Biopsy or vertebral body biopsy … and proceed to apply for postoperative spine surgery. Previously there were many applications assisted during surgery such as navigation system, O-arm, magnetic resonance in surgery, but the rate of bolt stuck to wrong position is as high as 10-25% in surgery. Scoliosis correction and about 4.2% in degenerative patients. However, with the use of Renaissance robots in the surgical treatment of cases of thoracic-lumbar spine traumas, vertebrae and herniated disc hernias, The error rate is due to the accuracy and safety of bolting through the spinal cord. Organized research and application of robots in international spine surgery donated to the Department of Spinal Surgery and Assoc. Nguyen Van Thach Medal “For the pioneering in the field of precision robot application support Renaissance to treat patients. PGS.TS. 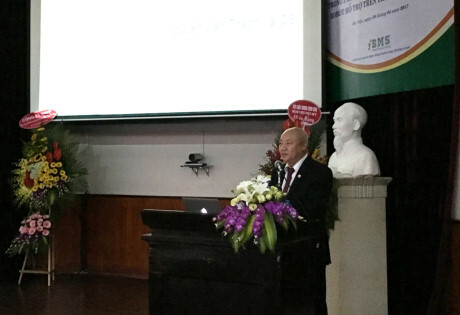 Nguyen Van Thach said that X-ray exposure to surgeons and patients during surgery is a major problem when screwing the stalk. More or less exposure depends on the surgeon’s experience and surgical pathology. But now, under the correct Renaissance positioning robot, X-ray exposure has decreased to 98.2% compared to classic screw-in surgery. This minimizes the risk of cancer of the surgeon and the patient. TS. Dinh Ngoc Son, Chief Operating Officer of Spinal Surgery, said: “The process of implementing the correct spinal anesthesia using Renaissance precision assistive robot, we have performed 1,255 screws with accuracy of 98.3% Clinical improvement of neurological symptoms in patients with vertebral fractures achieved good results, with no complications during bolting, especially in patients with thoracic-lumbar thoracic surgery. The way back. Surgical time was significantly reduced compared to conventional sclerotherapy lasting up to 10 hours, with an average of only one and a half hours with spinal trauma and 3 hours with a patient with spinal cord injury, including Both burned bones. 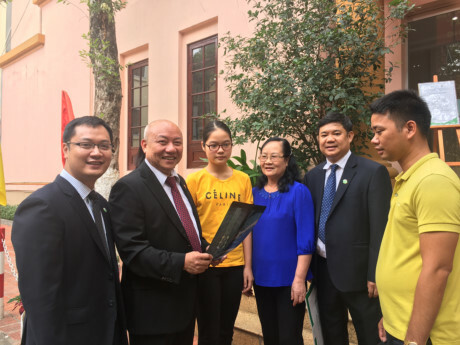 Appreciate the achievements of leading the successful application of robots to the spine surgery of Vietnam, the Organization for Research and Application of robots in international spine surgery has donated Spinal Surgery Faculty – Hospital Viet Duc and People’s Doctor, Assoc. Nguyen Van Thach Medal “For the pioneering in the field of precision robot application support Renaissance to treat patients.